The Fourth Ministerial Conference of the World Trade Organization, also known as the WTO Fourth Ministerial Conference, was held at the Sheraton Doha Hotel and Resort, Doha, Qatar from November 9–13, 2001. At this conference, ministers from all WTO members launched the Doha Development Agenda. At the 2001 conference, trade ministers agreed to undertake a brand new round of multilateral trade negotiations and services The ministers passed two declarations. The first, the main declaration folded the ongoing negotiations in agriculture and services into a broader agenda, which is commonly known as the Doha Development Round. In addition. the Doha agenda included the topic of industrial tariffs, topics of interest to developing countries, changes to WTO rules, and other provisions. The second declaration dealt with the Agreement on Trade-Related Aspects of Intellectual Property Rights (TRIPS) and allow government to be flexible of TRIPS to deal with health problems. The meeting took place just two months after the World Trade Center attack. As a result, some government officials called for greater political cohesion and saw the trade negotiations as a means toward that end. Some officials thought that a new round of multilateral trade negotiations could help a world economy weakened by recession and terrorism-related uncertainty. The Doha Ministerial Declaration mandate for agriculture calls for comprehensive negotiations aimed at substantial improvements in market access; reductions of, with a view to phasing out, all forms of export subsidies; and substantial reductions in trade-distorting domestic support. These topics — domestic support, export subsidies, and market access — have become known as the three pillars of the agricultural negotiations. The Declaration also provides that special and differential treatment for developing countries would be an integral part of all elements of the negotiations. The Declaration took note of non-trade concerns reflected in negotiating proposals of various member countries and confirmed that they would be taken into account in the negotiations. March 31, 2003 was set as the deadline for reaching agreement on “modalities” (targets, formulas, timetables, etc.) for achieving the mandated objectives, but that deadline was missed. 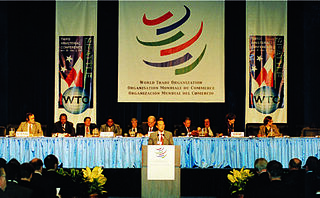 During the rest of 2003, negotiations on modalities continued in preparation for the fifth WTO Ministerial Conference held in Cancun, Mexico September 10–14, 2003. The Doha Declaration on Public Health sought to alleviate developing country dissatisfaction with aspects of the TRIPS regime. It delayed the implementation of patent system provisions for pharmaceutical products for least developed countries (LDCs) until 2016. The declaration committed member states to interpret and implement the agreement to support public health and to promote access to medicines for all. The Declaration recognized certain “flexibilities” in the TRIPS agreement to allow each member to grant compulsory licenses for pharmaceuticals and to determine what constitutes a national emergency, expressly including public health emergencies such as HIV/AIDS, malaria, and tuberculosis or other epidemics. The conference also approved the accession of China to the WTO on November 10. ^ Fergusson, Ian F. (2008-01-18). "World Trade Organization Negotiations: The Doha Development Agenda" (PDF). Congressional Research Service. Archived from the original (PDF) on 2008-07-25. Retrieved 2008-07-26. ^ "Conference ends with agreement on new programme". World Trade Organization. 2001-11-14. Retrieved 2008-07-31. ^ Fergusson, Ian F. (2008-01-18). "World Trade Organization Negotiations: The Doha Development Agenda" (PDF). Congressional Research Service. p. 2. Archived from the original (PDF) on 2008-07-25. Retrieved 2008-07-26. ^ Charles, Hanrahan; Randy Schnepf (2005-11-09). "WTO Doha Round: Agricultural Negotiating Proposals" (PDF). Congressional Research Service. Retrieved 2008-07-31. ^ Ilias, Shayerah (2007-12-20). "Intellectual Property Rights and International Trade" (PDF). Congressional Research Service. Archived from the original (PDF) on 2008-05-12. Retrieved 2008-07-31. ^ "WTO Ministerial Conference approves China's accession". World Trade Organization. 2001-11-10. Retrieved 2008-07-31. The World Trade Organization (WTO) is an intergovernmental organization that is concerned with the regulation of international trade between nations. The WTO officially commenced on 1 January 1995 under the Marrakesh Agreement, signed by 124 nations on 15 April 1994, replacing the General Agreement on Tariffs and Trade (GATT), which commenced in 1948. It is the largest international economic organization in the world. The Cairns Group is an interest group of 19 agricultural exporting countries, composed of Argentina, Australia, Brazil, Canada, Chile, Colombia, Costa Rica, Guatemala, Indonesia, Malaysia, New Zealand, Pakistan, Paraguay, Peru, the Philippines, South Africa, Thailand, Uruguay, and Vietnam. The World Trade Organization's Ministerial Conference of 1996 was held in Singapore on December 9 - December 13, 1996. The inaugural meeting for the organisation since its formation. The event was hosted by the government of Singapore at the Singapore International Convention and Exhibition Centre in Suntec City. The Doha Development Round or Doha Development Agenda (DDA) is the trade-negotiation round of the World Trade Organization (WTO) which commenced in November 2001 under then director-general Mike Moore. Its objective was to lower trade barriers around the world, and thus facilitate increased global trade. The WTO Ministerial Conference of 1999 was a meeting of the World Trade Organization, convened at the Washington State Convention and Trade Center in Seattle, Washington, USA, over the course of three days, beginning Tuesday, 30 November 1999. A week before the meeting, delegates admitted failure to agree on the agenda and the presence of deep disagreements with developing countries. Intended as the launch of a new round of multilateral trade negotiations that would have been called "The Millennium Round", the negotiations were marred by poor organization and controversial management of large street protests. Developing country representatives became resentful and uncooperative on being excluded from talks as the United States and the European Union attempted to cement a mutual deal on agriculture. The negotiations collapsed and were reconvened at Doha, Qatar, in November 2001. The Doha venue enabled on-site public protest to be excluded. Necessary agenda concessions were made to include the interests of developing countries, which had by then further established their own negotiation blocs, such as the Non-Aligned Movement and the Shanghai Co-operation Organisation. Thus, the current round is called the Doha Development Round, which has since 2008 remained stalled as a result of diverging perspectives regarding tariffs, agriculture, and non-tariff barriers such as agricultural subsidies. The stated aim of the World Trade Organization (WTO) is to "ensure that trade flows as smoothly, predictably and freely as possible". However, it is important to note that the WTO does not claim to be a "free market" organization. According to the WTO, it is "sometimes described as a 'free trade' institution, but that is not entirely accurate. The system does allow tariffs and, in limited circumstances, other forms of protection. More accurately, it is a system of rules dedicated to open, fair and undistorted economic competition." This compatibility to a certain degree of protection is proved, for example, by the fact that cartels like the OPEC have never been involved in trade disputes with the WTO, despite the evident contrast between their objectives. The Agreement on Trade-Related Aspects of Intellectual Property Rights (TRIPS) is an international legal agreement between all the member nations of the World Trade Organization (WTO). It sets down minimum standards for the regulation by national governments of many forms of intellectual property (IP) as applied to nationals of other WTO member nations. TRIPS was negotiated at the end of the Uruguay Round of the General Agreement on Tariffs and Trade (GATT) between 1989 and 1990 and is administered by the WTO. The World Trade Organization (WTO) is an intergovernmental organization which regulates international trade. The WTO officially commenced on 1 January 1995 under the Marrakesh Agreement, signed by 123 nations on 15 April 1994, replacing the General Agreement on Tariffs and Trade (GATT), which commenced in 1948. The WTO deals with regulation of trade between participating countries by providing a framework for negotiating trade agreements and a dispute resolution process aimed at enforcing participants' adherence to WTO agreements, which is signed by representatives of member governments and ratified by their parliaments. Most of the issues that the WTO focuses on derive from previous trade negotiations, especially from the Uruguay Round (1986–1994).